Additionally, the allocation of the state aid to publishing houses and the related permits to publish are being granted based on the government’s preference. The media Clarín and Nación have received in these three years millions in advertising campaigns and significantly expanded their means of influence and telecommunications business through permits and mergers of companies granted by the Macri administration. On the other hand, Net TV, from the publisher Perfil was immediately accepted in the audiovisual network system, while other media like Barricada TV and Pares TV have been waiting for years to be access the cable programming. Since 2015, according to a report by the Press Union of the Province of Buenos Aires, more than 3,000 journalists have lost their jobs. The most famous case was the one of the state news company Telam, which lost almost a third of its factory with an administrative decision, which could be reversed in court, thanks to the workers’ struggle and protest. National Radio and Public TV also have their programming seriously affected by the constant cuts. In this context, the cooperative and community media face an uncertain and gloomy perspective, which undoubtedly began when the current administration partially repealed Law 26,522, better known as “media law”, which benefitted cooperative and community media. Notably, a recent Law voted in Congress significantly affects cooperative newspapers in the country. This law deregulates the paper that is used to print the newspapers, which benefits large companies to the detriment of smaller ones. On this situation, the Associative Federation of Newspapers and Cooperative Communicators of Argentina (Fadiccra), declared: “we warn the national community that this new rise of monopolistic groups in Argentina is dangerous since it detains the necessary leverage in the National Congress to modify the law with the sole objective of maximizing the profits”. As for the development and promotion funds – called FOMECA – which were created by law to support independent media, that operates in the innermost parts of the country are not duly implemented. In fact, this government has repeatedly downplayed the importance of media networks that perform an important task of communication in disadvantaged areas especially when it comes to focussing on community problems rather than on business and advertising. Recently, community media representatives protested in front of the government entity (ENACOM) in charge of granting broadcasting licenses to radios. “Cable-operators’ refusal to allow community TVs such as Pares TV and Barricada to access the net silence voices, ignore conflicts and leave aside sources that do not have space in the commercial media, eliminating de facto from the audiovisual space the expressions of alternative sectors in communication. Standing above the laws decide who speaks and who does not, benefiting from the support of a government that deepened the concentration to levels never before reached,” they said in the statement released after the activity. 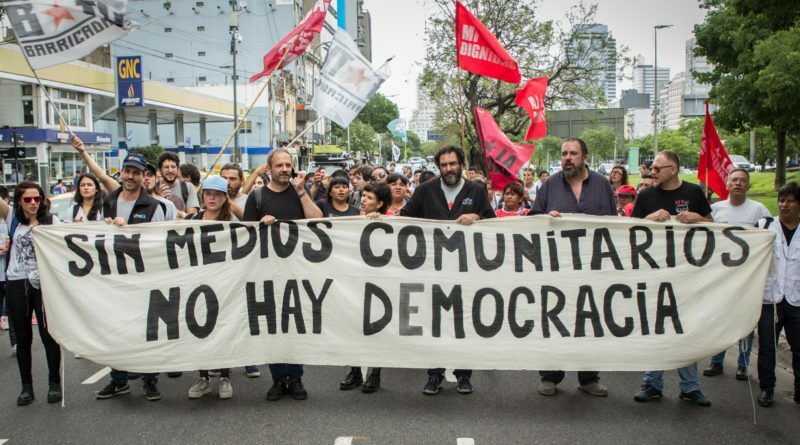 Despite the difficult reality that commercial, state and community media face, it is worth noting that the effort of the press workers (together with trade unions, social organizations, political parties and actors of the Social, Solidarity and Popular Economy) allowed them to continue forward informing the Argentinian society. “This way, community media networks, radios and TV channels will continue their actions against a government that […] discriminates community media and threatens democracy […]. This is a moment of systematic media close down, with thousands of communication workers made redundant, […], with a very dense large media concentration. This situation has generated a permanent mobilisation in the different sectors involved, in order to claim ever more strongly: Without community media there is no democracy”, said Liliana Belforte, associated to the cooperative for Social Communication Ltda, which has been running FM En Tránsito for 32 years, and is still on air.